A lead generation WordPress theme focused on converting website visitors into customers. 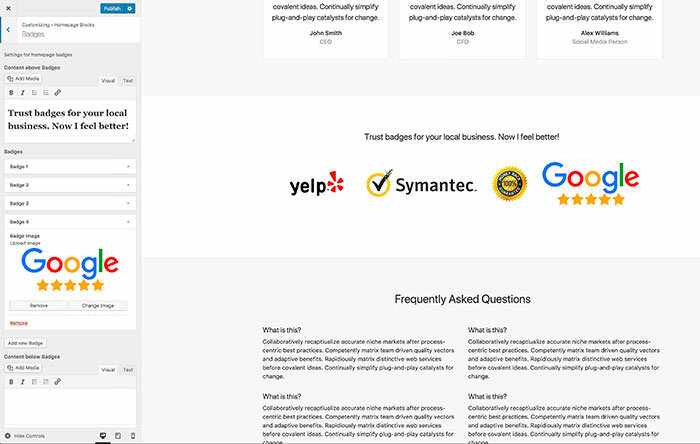 Use this theme for clients, PPL sites and/or any other business you would like to generate leads for. 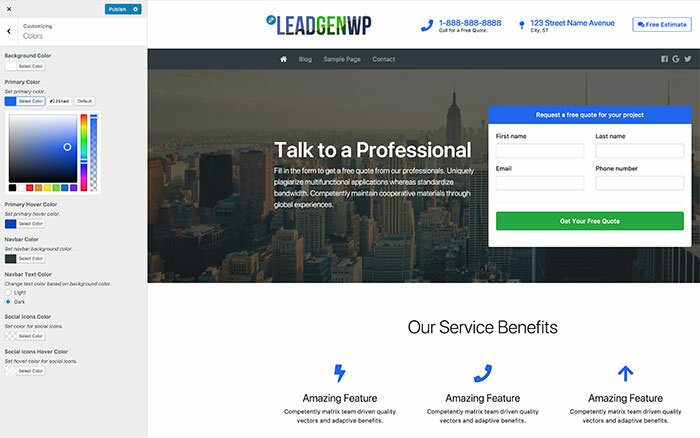 LeadGenWP is a WordPress theme that is focused on one thing, generating leads. If you are looking for one of those all-on-one themes that include every plugin, page template and page builder known to man, this is NOT the theme for you. LeadGenWP has just the features and elements needed, nothing extra. This helps reduce your site load time and increase your conversion rate. Having a fast loading website is one of the many important factors when doing search engine optimization. 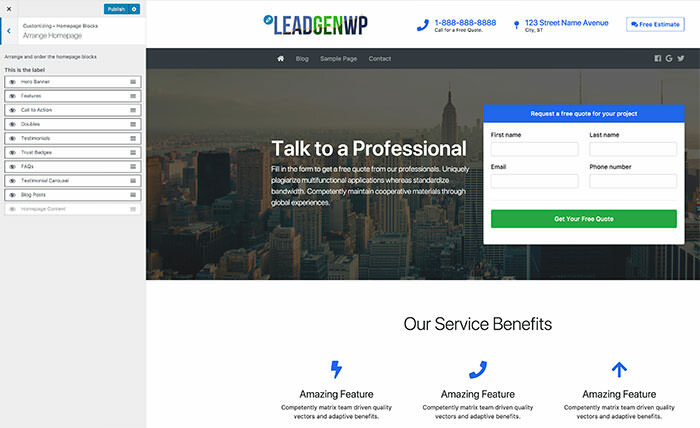 If you research and study the top converting web designs and landing pages online you will notice all the elements in LeadGenWP. The theme is fully responsive and utilizes the customizer for all the options so you can watch all your changes in real-time. This allows you to do things like change the primary color scheme, enabled/disable homepage sections(blocks), and drag and drop the homepage blocks to arrange in any order you would like. The themes on LeadGenerationWP stay up-to-date. Once you are a member, you can download and use any of the products on as many client or personal sites as you would like. Be sure to check out the support section for both video and written documentation on how to use every feature within each plugin/theme. Are you tired of hacking other themes to optimize and get them to work the way you want? 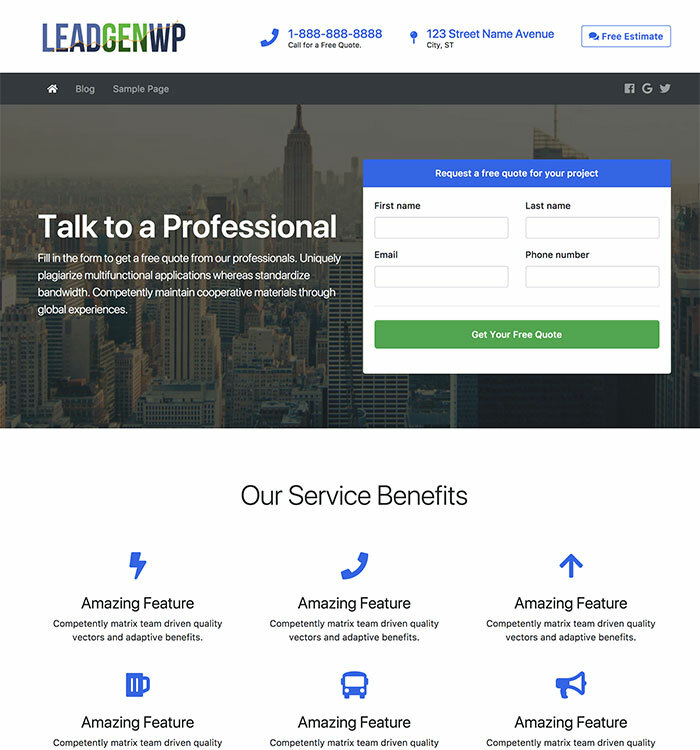 LeadGenWP is your solution! Change the color settings within the customizer. Edit homepage block settings with the customizer. Drag and drop blocks to arrange the homepage from the customizer. Developers: Each theme comes with a “Developer” version that is stripped down to the basic HTML, PHP, and Sass for the perfect base theme. They also include npm, Gulp, and other popular tools to enhance your development process.